I am a multi crafter. There are so many crafts that play wonderfully together in a single project. This is one of those multi craft project. This 12 inch diameter wool felt table rug incorporates embroidery and crochet to create this beautiful, textural design. Wool Felt – this project was created from a wool / rayon blend. I do prefer to use either a predominantly wool or wool / rayon blend. I’m not a huge fan of acrylic for this project, but it can be used. Worsted Weight (4) yarn in 2 colors. I used Paton’s Classic wool in a single color and in a self striping color. Large eye (tapestry or crewel), sharp point needle for sewing hexies to felt and to embroider blanket stitch edging. Crewel wool (tapestry wool) for blanket stitch. Some people may want to use their worsted yarn to blanket stitch the edging of the mat. Be sure and text your yarn before you make your decision. Some worsted yarns will abrade quickly and pull apart if you attempt to use as decorative stitching. Shaping / blocking materials as desired. Plate or tray, ect to make a circular rug base. Rnd 2, Ch 3, Work 1 dc in the same stitch, ch 1, *Work 2 dc in the next stitch, ch 1* Repeat from * to * around. around. Join to top of beginning ch 3 with a slip stitch. Ch 3 space around) Join to beginning sc with a slip stitch. Cut and secure yarn. Shape and block as desired. Fold rug base in quarters to find center. Mark center. Position central hexie in place. (use spray adhesive if desired to hold hexies in place while sewing) Whip stitch in place. 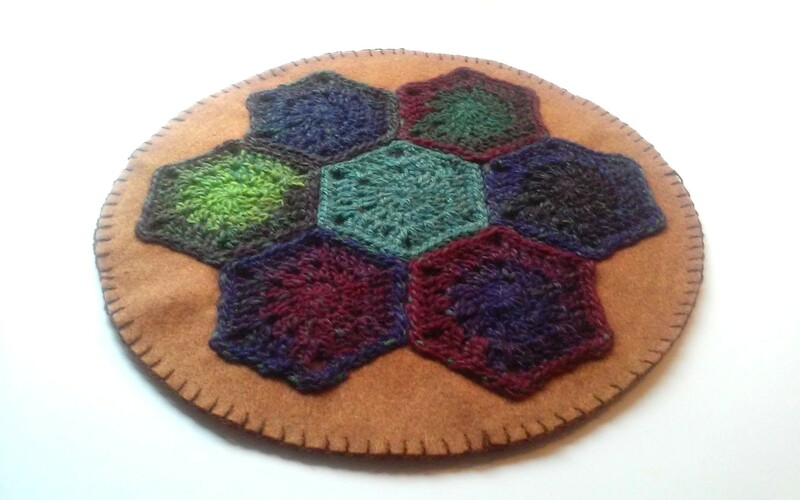 Position each remaining hexies around central hexie. Whip stitch in place. Place finished rug base top to felt designated for rug base bottom. (use spray adhesive if desired) Cut to size. With tapestry wool, blanket stitch around. If you feel that you need to press the rug, place it face down on a padded surface, cover with a pressing cloth. The washability will depend on the fiber content of both the felt and the yarn.